Presenting a handcrafted anchor Christmas tree ornament with authentic Swarovski rhinestones. Item ships in 3-7 days. Ornament shown in royal blue. Choose from 12 assorted solid colors when you add the item to your cart. Make sure you view our other miscellaneous ornaments. Web pages copyright© 2003-2012 by DesignerOrnaments.com. All Rights Reserved. 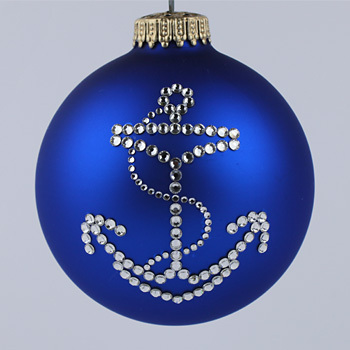 Decorative anchor Christmas tree ornaments made with genuine Swarovski rhinestones can be purchased at Designer Ornaments.